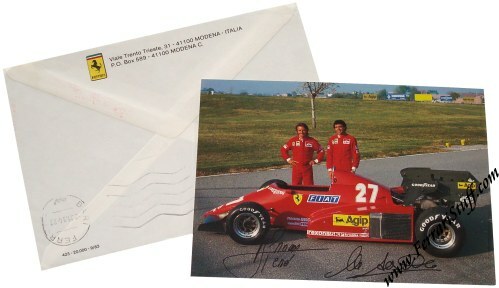 1984 Enzo Ferrari Signed Rene Arnoux and Michele Alboreto Postcard. This official Ferrari factory issued postcard of Michele Alboreto and Rene Arnoux has been signed by "The Drake", Enzo Ferrari, himself in October 1984. 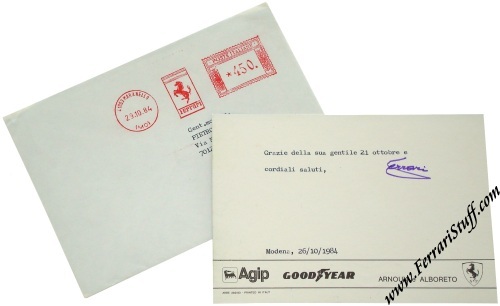 The typed text on the back refers to the kind greetings that Enzo received and sends his regards in return. The card is in more than excellent condition and the signature is nice and crisp.